To find the 'right' chords with a given melody is something that takes some time, experience and of course your ears. Here you'll find a few hints to get the job done. does not use exotic scales, but only simple major or minor. First thing to do is determine the tune's key it is written in. Most likely, the note the melody ends with will be the looked for key. Often, the first 'real' note the tune starts with (skipping an upbar) is also the key-note. Secondly, determine whether the tune has a sad (minor) or a happy (major) feel. Thus a tune ending on the note C and having a sad feel, will most likely be written in the key of C-minor: Cm and will thus have three flats. If the last note of a happy tune happens to be an A, it will be written in A major thus using three sharps. Knowledge of the tune's key limits our search for chords significantly. Many tunes will use mainly three chords that are closely 'connected' to the tune's key. Which chords are they? 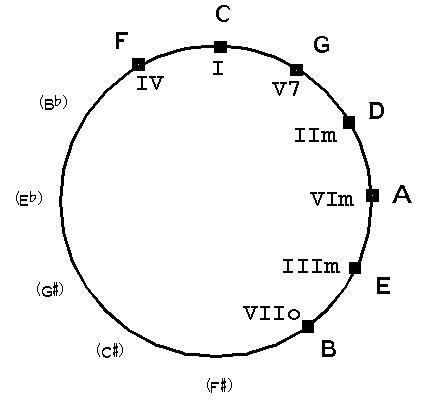 The Circle of fifths guides us to the answer. Look (in the circle above) at the right of the key we found (assume c-major, so focus on C) and note the G.
The chord sequence G7 C has a strong tension release feeling. The G7 chord pulls strongly towards the C-chord - which happens to be the key of our tune. 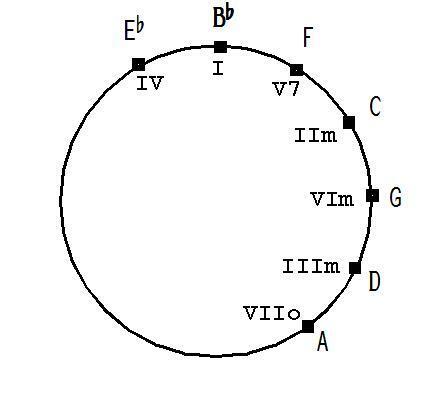 In fact, a great deal of the chord transitions will be the G7 C, especially the last two chords will be G7 and C for most tunes in the key of C.
The notes of the C chord (c-e-g) and the G7 chord (g-b-d-f) define almost the entire scale, only the a is not available. So we're looking for a chord that has an a in it, and uses only notes of the c-scale. The a-major chord will not do because is contains a c-sharp that does not fit into the c-scale. An a-minor chord fits into the scale but has that sad feel that we do not like within a 'happy' tune. The other chord we are looking for stands at the left side on the circle and is the F (f-a-c). That leaves us with the three chords to try in the key of c-major: C, G7 and F. In that order. Play a C chord as long as it fits. Try a G7 if the C does not fit anymore, and only when both C and G7 do no fit try the F chord. Quite often you will find that the melody uses the note 'a' when the need for the F-chord arises. Try C chord first, ok that fits for the first bar (both e and g are within the C-chord). and add a 7th to its clockwise neighbour. As an example for the key of a-major: A, E7 and D, for eb-major: Eb, Bb7 and Ab etc. If you are determining chords for a tune in a minor-key, things get a bit more complicated, as there are different minor keys, each with their own scale and chords connected. Lets start with the easiest, the natural minor key. You may retrieve the natural minor scale in the key of a by playing white notes on a piano keyboard starting from a. Again we are looking for the three chords that will cover the entire scale and correspond to the 'minor feel'. Start by building a chord on the first note of the scale: a-c-e and ther we have our fundamental chord for the a-minor scale thew Am chord. Using the same trick as we discovered with the major scale: go up a fifth from a and build a chord from there: e-g-b (we get the b from the next higher octave) or even ad a 7th e-g-b-d for an Em7 chord. 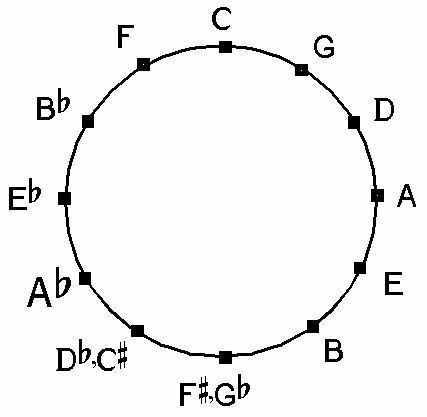 Once again look at the scale and we are missing one note: the f. Same trick as before look at the counterclockwise neigbour of the a on our circle and we arrive at the Dm chord (d-f-a) containing the missing f note. We now have the chords Am, Em7 and Dm for the key of a-minor. The same tune assuming a minor key could be accompanied with the minor chord-set as above. For many other real minor tunes ther remains one small problem. Many minor-key tunes do not use a natural minor key but raise the last note of the scale (g) to a g-sharp, resulting in a different chord set: Am, E7 and Dm. This is usually called the harmonic minor scale. The raising of the last note of the scale hast the effect creating a strong pull from E7 to the root chord of the scale, the Am chord. Not as strong as the G7 C as in the major scale but much stronger than Em7 Am. Now every note of the scale has got its own chord. But what if we were looking for chords of Bb-major? If you already have the tune in MusiCAD you might as well use the chord wizard to preselect the chords for you, based on the tune's key. If you ever seen a jazz score you'll notice a bunch of other chords adding some spice to a tune. Almost any jazz accompaniment uses heaps of alterations using major sevenths, minor sevenths, diminished, half-diminished, sixths, ninths, supended 4th, suspended 2nd etc. Let's try to add a few more chords, not limiting ourselves anymore to the in-scale chords we found earlier. The added chords C#o, D7, G#o, F#o G+ make the accompaniment pull the melody forward using the semitones-pull rule: semitone distances in a melody line (or bass line) tend to give a very strong pull-forward feeling. The chord sequence C-C#o finds relieve in the provided solution: Dm which - followed by D7 containing an f# which pulls to the G (and the c - 7th in D chord - to the b.from the G-chord) G#o in its turn does the same in pulling to Am while supporting both melody notes d and f. The Fmajor-seventh is adding color as well as supporting the off-beat note e in the melody. The third dim-chord F#o again pulls to the G(7) which followed by an augmented G containing a d# pulls to the e within the C-chord adding power to the pull from the existing b-c pull. The final G7-C sequence simply puts the pulling at ease - we're home again.